Liczba stron: 98 Jest to ujednolicona liczba stron, która ułatwi Ci porównanie długości książek. Każda strona Legimi to 200 słów. All rights reserved. No part of this publication may be reproduced, stored in a retrieval system, transmitted in any form or by any means, electronic, mechanical, photocopying, recording or otherwise, without the prior permission of the author. It was a rainy afternoon, the kind that never ends. In a corner of the attic, amongst dolls, stuffed animals and a thousand other knick-knacks, Emily and Anna were silent, with their arms at their sides and long faces which touched their knees. "What a rip off," said Emily "being forced to do something so hateful and ridiculous. I don’t think that I’m going to speak to my mother for at least ten years. And you, what are you going to do?" "I’m never taking out the rubbish again, and neither will I clear the table," replied Anna. "If only our mothers weren’t so ambitious and vain," said Emily. "If my father had been at the meeting, things would have gone differently". "Yeah, but our mothers aren’t the only problem. Did you see the teacher’s face when that guy entered?" "Yes, she looked hypnotized. That disgusting slick being has charmed all the female teachers and mothers, unfortunately not only ours, but also those of our schoolmates!" "So, because of his soppiness, we are forced to do ten hours of drama a week," said Anna. "Did you see how he got Miss Micheletti on Tuesday?" "Yes, unfortunately. She was clearly smitten when he came into class. Then, when he began to speak, it was a done deal: she looked at him with adoration"
"And then came the coup de grace, when he kissed her hand, and Miss Micheletti definitely collapsed, with no way out," Emily said with a disgusted tone. "Anna... Emily... Come down immediately. Come on, hurry up!" Cried Anna’s mother from the ground floor. Emily and Anna went down the steep stairs that led to the floor below, looking defeated. They said goodbye, arranging to meet the next day for school. They parted with a wink. The gesture was a promise. Sergej would find out very soon that it was not easy to transform two hardened pests into two school play actresses. The next day Anna and Emily were chatting as usual at the school gate before lessons commenced. "Look at what i had to wear! This is because my mother thinks I look nice for Sergej in this dress. I feel so silly, all dressed up”. "You're right Anna, this dress does make you look a bit odd”. "Odd? I would say ridiculous, but they will pay for this too”. The bell signalled the start of classes, so Emily and Anna stood up to go, without hurrying. "Come on, hurry up, all your classmates have already entered. You are late as usual!" warned the care taker, shaking her broom to push the two girls forward, wielding it eloquently as if she was a warrior with a sword. That greeting was all it took for the two distressed pupils to realize it would be a long, hard day. Their shuffling footsteps left a sad echo in the corridors as they walked toward the classroom and the lesson that awaited them. Anna and Emily were famous in their school for having got up to a lot of pranks and all kinds of trouble. The two girls were very lively, with a vivid imagination which often got them into a pickle. Once at their classroom door, they saw with dismay that theirs were the only empty seats. The other students were all seated and alert, well aligned folders on each desk and their classmates spotlessly clean. The teacher's face was very angry. "Is this the time to show up to class? And if Sergej had arrived? You have not even deigned to arrive on time for such an important day!" “Oooh! Come on, the bell has only just rung," thought Anna, silently walking over to her desk. The teacher was particularly agitated that morning. She broke off about a hundred pieces of chalk in an attempt to explain the lesson of the day and who knows how many other victims she would have sacrificed had Sergej not arrived. As befits a consummate actor, he entered the class with a ceremonious air, flashing a toothy smile at the teacher. His head was glistening with gel and he boasted an enviable tan. "Good morning ...Madame ... or Miss?" He said with a slow and sloppy tone. "Good morning ... hmm ... Miss," corrected the teacher, sounding confused and visibly blushing. "The man’s a genius, we must grant him that" Emily said quietly to her friend. "Hello children! As you know, you and I will be spending a few hours of the week working together. Today we will stay in the classroom, but next time we are going to the theatre so we can have more space and enjoy the magical atmosphere that actors breathe every day”. "You know she always wants to get noticed, that silly arrogant girl" said Emily. "Yes dear, how can we help?" Asked the teacher sweetly. "Listen... Since I will clearly be the main character in the final production, I wondered if I could wear a princess dress that my mother sewed for me for Carnival”. "Wow! Listen to her!" Anna said, nudging her friend sitting right next to her. "Can I wear a princess’s dress?" Emily said softly, mimicking their classmate’s voice. "We shall see my dear, we haven’t yet decided what we’ll be working on," answered Sergej, accompanying his statement with a smile that showed again his mouth full of teeth. Sergej’s lesson was pretty boring. The actor gave a long and very dull description of the actor's profession and his responsibilities, making it sound more like an exaggerated celebration of the speaker’s personal qualities. Anna and Emily were both reprimanded at rather close intervals by their teacher after having been caught conspicuously yawing during Sergej’s gruelling tales. The rest of the morning scrolled by at the usual slow and rhythmic pace. As the hours passed, Anna and Emily peered out of the window in turn. They wanted to get out there and enjoy the beautiful day, even if only for the short walk that would have taken them back to their homes. It was a pleasant trip home. The sky was clear and the air was warm, announcing the arrival of spring. Emily and Anna walked side by side and chatted vivaciously. "So, will you help me with the prank?" Said Anna. "Definitely! You can count on me" Emily replied decisively. "Have you read the newspaper today?" "The newspaper? Since when do you read the newspaper? "Emily asked surprised. "I read an interesting article. It spoke about the theatre where we're going to do the rehearsals". "Oh yeah? What did it say? What did it say?" Emily asked impatiently. "If you're quiet for a moment I'll tell you!" Anna replied, huffing. 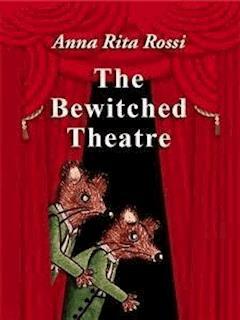 "Well, it said that the theatre is bewitched" Anna said in one breath. "Yes, that's right, there is a strange legend about that building. Wait ... I took some notes from the newspaper", and saying this Anna took out a notebook and showed her friend a sheet containing hurried and tiny notes. "A legend? What legend are you speaking about? "Emily asked, sounding agitated. "Now, I will read you what I wrote, ‘Long ago, the Artena theatre was the home of an obscure character named Gerberto who lived in the tenth century. We know almost nothing about his origins, while we do have a pretty detailed documentation about his later life. He was educated at Fleury, which he fled to study the occult sciences in Muslim Spain. There were rumours he took away a valuable book which belonged to his guest, an Arab philosopher. The legend says that thanks to this book, which contained some powerful spells, Gerberto made a pact with a demon, gaining enormous power and destroying anyone who blocked his path. After Spain the chronicles place him in Rome where, thanks to necromancy, he discovered buried treasures and made a statue of a human head which apparently was able to answer any questions you asked it. Subsequent documents recorded many journeys, and finally in May 1003, Gerberto disappeared without leaving any trace. This, of course, increased obscure speculations, like the one that his demon, after so many honourable services, claimed his soul in exchange. Because of the owner’s sad notoriety, nobody wanted to set foot in his house for a very long time...’". "But, why is it a theatre now? Did somebody buy it?" Asked Emily, who until that moment had been listening, hypnotized. "No, because of the legend, the house remained uninhabited and it fell to ruins. Afterwards, when things started to settle down the house became Council property and a theatre was built in its place". "Yes, but why was this theatre closed for so long?" Emily asked with some curiosity. "Because there were some strange incidents and none of the companies contacted wanted to work in this theatre, considered bewitched. You know how superstitious actors are. Imagine if someone had the courage to come here to put on a drama or another show after that series of misfortunes". "Sure, but... I mean, do you realize what you are saying? It is a rare and unique opportunity. We are going to rehearse in a haunted theatre" said Emily enthusiastically. "Well I never! And if it is true that this theatre is bewitched? Maybe Gerberto’s ghost is locked in some cupboard". "Do you know what I say? I don’t like Sergej, but the idea of this peculiar theatre makes me want to start now" Emily said with determination. "Me too, maybe we’ll also find Gerberto’s famous spell book," said Anna hopefully. "Yes, and then you can translate it from Arabic." "Sure, my father’s friend works as a translator and knows Arabic well" Anna said. "But I don’t like the idea of anybody else entering our secret investigations" Emily said crossly. "Hey, we can cross that bridge when we come to it. We haven’t found any Arabic spell book, and it might not even exist" repeated Anna. Without realizing it, the two girls had arrived at their destination. Emily lived next door to Anna. In the evening, while their parents were relaxing in front of the television, the two friends would stay together and chat until their parents forced them to go to sleep. When they arrived in front of their homes they said goodbye a little reluctantly, perhaps even more reluctantly than other days. "Are you coming to my house after lunch?" Anna invited her friend. "You bet, we have a lot of things to discuss," said Emily decidedly. "Sure, we’ll talk about our revenge. You'll see, this time we have to organize a fantastic prank, I can feel it’s going to be a good one" said Anna, hurrying home. "See you later" she said to Emily while her mother was opening the door. "Bye" Emily yelled back before disappearing behind her front door.